Given a string, write a c function to check if it is palindrome or not. A string is said to be palindrome if reverse of the string is same as string. For example, “abba” is palindrome, but “abbc” is not palindrome. 1) Find length of str. Let length be n.
2) Initialize low and high indexes as 0 and n-1 respectively. 3) Do following while low index ‘l’ is smaller than high index ‘h’. …..a) If str[l] is not same as str[h], then return false. …..b) Increment l and decrement h, i.e., do l++ and h–. 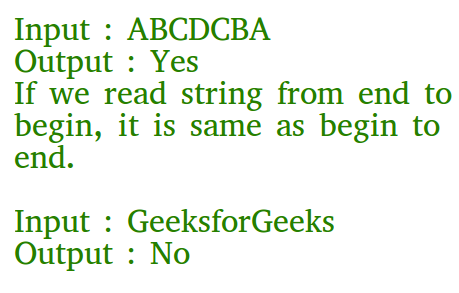 Following is C implementation to check if a given string is palindrome or not.